At this time of year, I'm especially smitten with all the delightful carbs like mashed sweet potatoes and stuffing. I can't help to notice that I seem to fill my plate with all things brown, orange, or cream. Yes, even I, have been known to skip the salad at the holiday meal. This year I wanted to make sure the greens didn't get left by the wayside. Green leafy vegetables should be a part of the party too. Dark leafy vegetables are a hard sell, I know. I don't care. I like them and I love how they become a touch sweeter with the cold. To enjoy that flavor however, they need to be fresh; especially if you want to eat them raw like I propose in the recipe below. 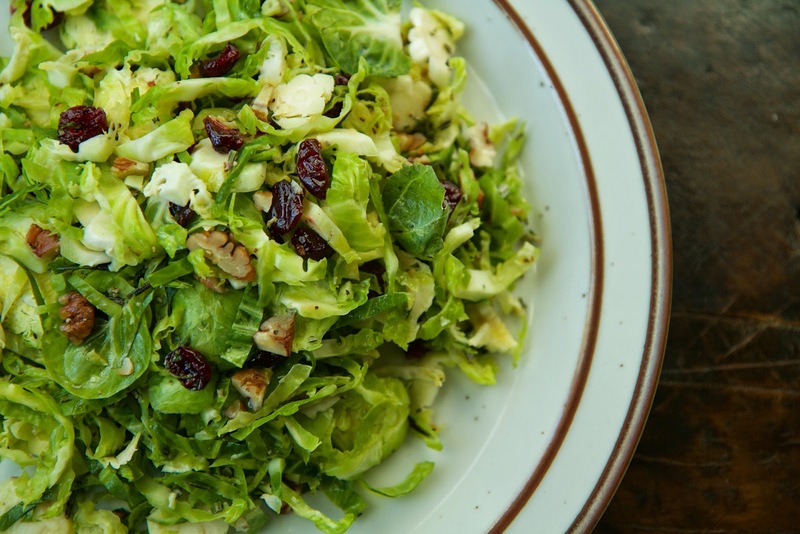 This raw Brussels sprouts salad is seasonal, and I think, festive looking too. 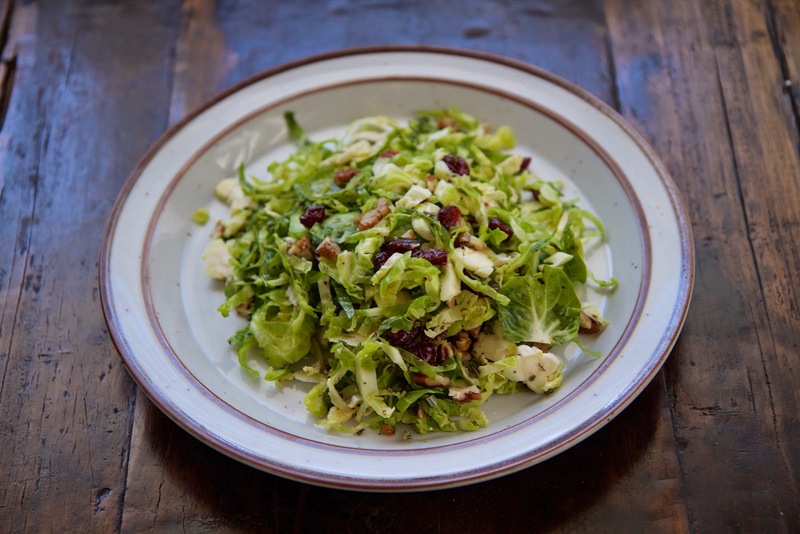 It's very filling and all those shredded baby cabbages are complimented by the toasty nuts, tangy lemon-ginger dressing, and tart cranberries. And, if no one wants to make room on their plate for it, well, fine, more for me. Here's to a well-balanced holiday meal. Using a mandoline or knife, shave or shred the sprouts. Place the shredded sprouts into a large bowl. Toss in the minced fresh rosemary, chopped toasted pecans and dried cranberries. In a small bowl whisk together the lemon juice, olive oil, honey and fresh ginger. Season with salt and black pepper.